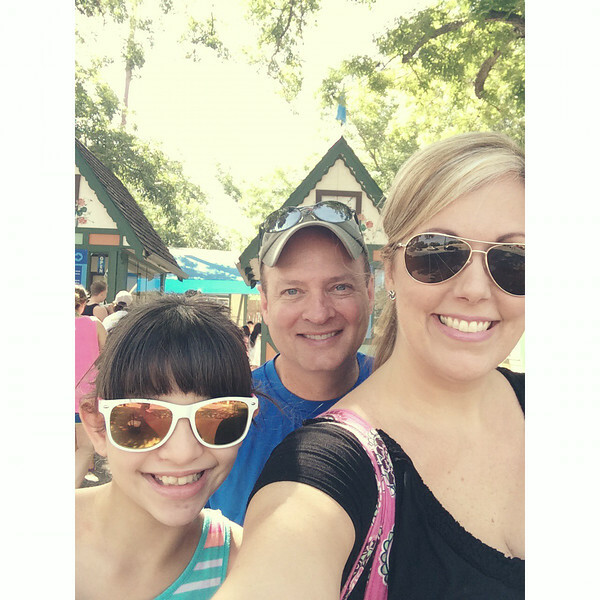 Last week we took what has apparently become our annual summer pilgrimage to the mecca of water parks, Schlitterbahn in New Braunfels. It was almost identical to the first, second and third times we've been there. We are nothing if not predictable, which I suppose can either be seen as boring or comforting depending on how you look at it. However, we did manage to make a few slight improvements this year. Our last two visits have been centered around the 4th of July holiday and closer to the weekend. Scott wanted to do the same thing this year so that he wouldn't need to take too many vacation days but eventually came around to my side of things and we decided to go earlier in the week and be at the park Tuesday and Wednesday, leaving plenty of buffer between us and the 4th of July crowds. We've never seen Schlitterbahn so not crowded. We had our pick of picnic tables--in the SHADE no less--to choose from to set up base camp and the lines for the rides were never (!!) long. Annelise and I both started singing "A Whole New World" (from Aladdin) as we first walked into the park and saw all the empty tables and no mobs of people. Also? We brought a cooler of water, Gatorade and my new favorite beverage, La Croix grapefruit sparkling water (sidenote: it's dee-lish and refreshing, but no calories, fake stuff and no sodium), along with a tote bag of essential snacks (Pringles, almonds, Goldfish, and the all important Golden Oreos). You might think that since this was not our first Shlitterbahn rodeo that we would've gotten ourselves together and brought a cooler years earlier in order to save on overpriced soda and souvenir mugs...but you'd be wrong. But I guess the fourth time is the charm. Maybe next year we'll add lunchmeat, cheese and bread (or something else picnic-y) so we won't buy slices of pizza for lunch. We got to ride our favorite rides LOTS of times since the park wasn't too crowded. We were happy as clams. In inner tubes. We spend most of our time each year at the original water park. It's the biggest and has the most variety (I think) of water rides. As you probably know by now, my fourth annual post, the tube rides are my favorite and we did them all (except for Bonsai Pipeline because it's all enclosed and dark). Our favorites in order are Whitewater (a swirly, super fast, tube ride that packs several water-y wallops), Cliffhanger (bumpy, fun waterfall at the end), Congo (fun waterfall then relaxing tube ride into the Comal River) and Raging River (longest tube ride with exciting fast parts and plenty of calm float-y parts that goes all across the park ending in the Comal River) and then Hillside (this comes in last because the lines can get long). Scott and Annelise will also do the body slide rides like Downhill Racer and Der Bahn. Once we were good and waterlogged Tuesday evening we changed into dry clothes to go to dinner in Gruene. In the past we've always just worn our swimsuit coverups (maxi dresses for the girls and a dry t-shirt for Scott) and kept our slightly soggy suits on, which is as about as delightful as you'd imagine. This year we packed an extra tote bag with a change of clothes for each of us and, oh my goodness, Annelise and I almost busted out singing "A Whole New World" again after we changed. Why did it take us four years to get ourselves together? Anyway, the first night after Schlitterbahn is always at The Gristmill out in Gruene (about a 10 minute drive). 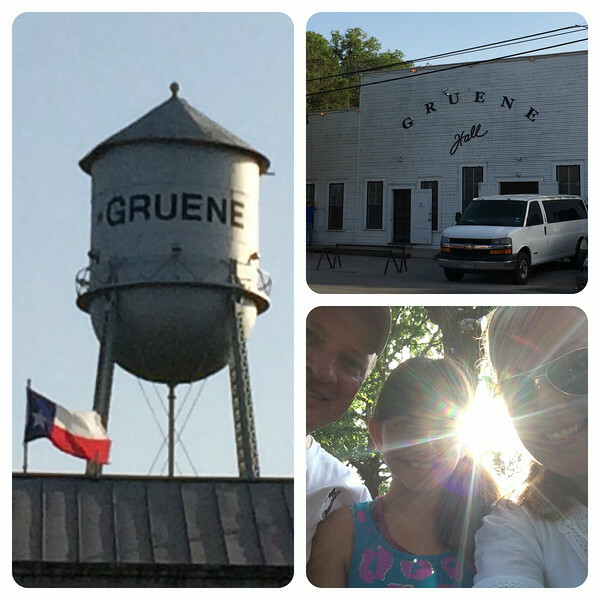 Gruene is just the cutest, full of shops and tiny town charm, although we never shop we just eat. The Gristmill is a casual restaurant behind Gruene Hall, which is an ancient dance hall, landmark and country music hot spot, we always enjoy the sounds wafting out as we walk to and fro. I'm sure you won't be surprised when I tell you we ordered the same meal we always do (well, Annelise usually changes hers up), the Gristmill Burger, which is slathered in queso, and a side of their sinful onion rings. Dee-lish. Is what it was. The next day got off to a bit of a rocky start, what with being a little bit later getting to the park and there being only two ticket booths open and several large groups of people waiting in line and oh, yeah, it was already HOT at 10:30. We may have been a bit snippy with each other. We set up camp at one of the picnic tables then caught one of the shuttles to Blastenhoff, one of the other water parks. We spent a few hours over there for Master Blaster and Torrent River, and for me to catch some rays and read on Torrent Beach, before schlepping back on the shuttle to finish up our day at the original park. Which is pretty much the same thing we do every year. 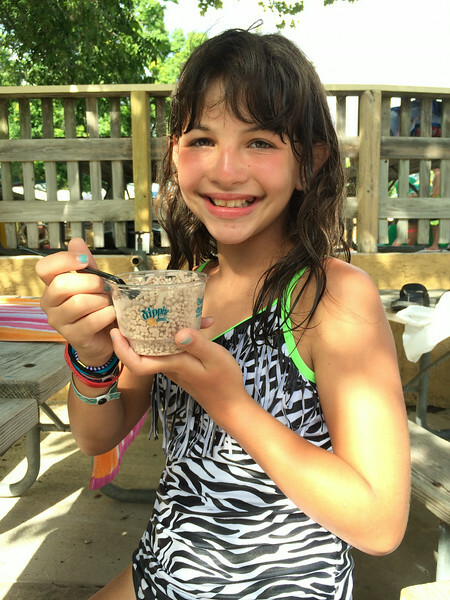 Dippin' Dots, because nothing is as refreshing as overpriced novelty ice cream. Good Karma sidenote: Annelise had lost her sunglasses the very first time she rode Whitewater on Tuesday (can you say wipeout? can you say we told her to wear them and not hold them?) and was highly upset but then when we checked at guest services Wednesday was beyond thrilled that someone had turned them in. Whew. We rode ourselves silly, taking advantage of no lines to ride Whitewater and Cliffhanger over and over. And then a few more times. We shut the park down then made our usual trek to Taco Cabana so we could sit outside in our coverups and soggy suits enjoying tacos and quesadillas. Just as we have done for the past two years. I'm okay with being predictable. La croix just came out with a few new flavors that you should check out. The apricot is delicious and the mango isn't half bad either. Ooh...those sound yummy. So far I've only tried the grapefruit and have been scared to branch out for fear of disappointment, thanks for the heads up!